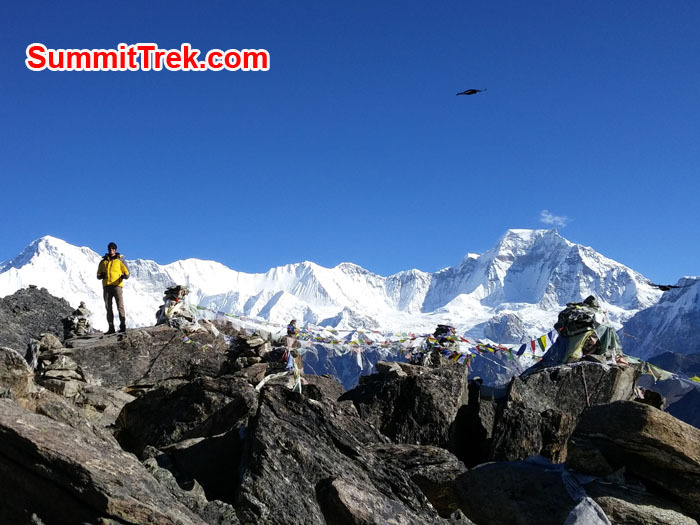 Greetings to all Everest Base Camp Lovers! 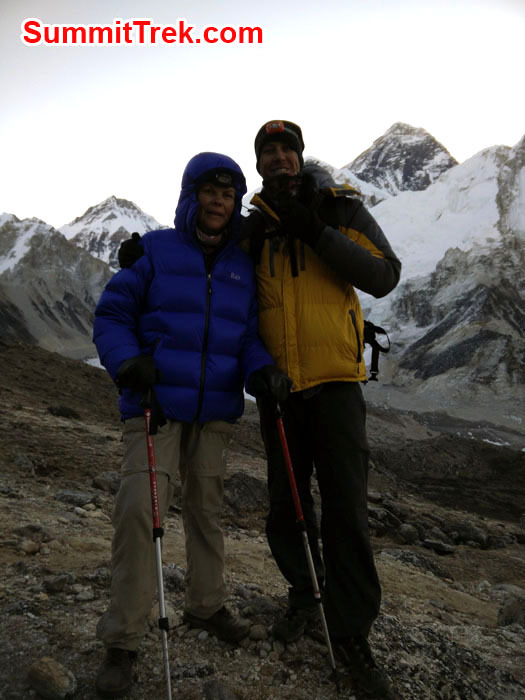 Our team of men and women of all ages have just returned from basecamp. 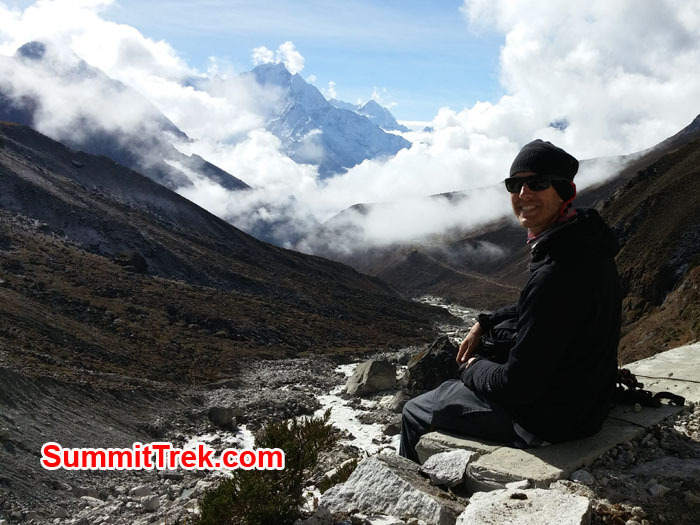 Everyone made it to Everest Basecamp, Gokyo Ri, Cho La Pass and Kala Pattar. Congratulations!!! It was a really exciting trek this year, as we had an unusual "dusting" of snow. 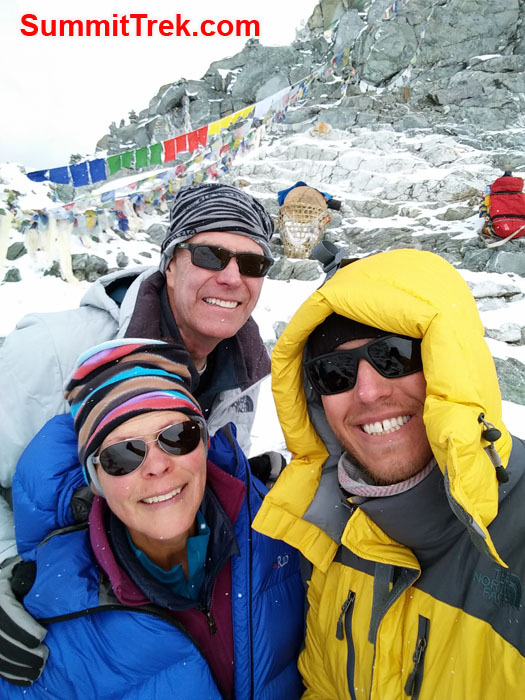 Still, our strong Sherpa team helped everyone to persevere and the group all succeeded in achieving their goal of reaching basecamp, bolstered by lots of hot tea, delicious food, and warm comfortable lodges all along the way. We welcome them back to sunny warm Kathmandu and Thanks to Everyone for Visiting Nepal!!! Members at CholaPass. 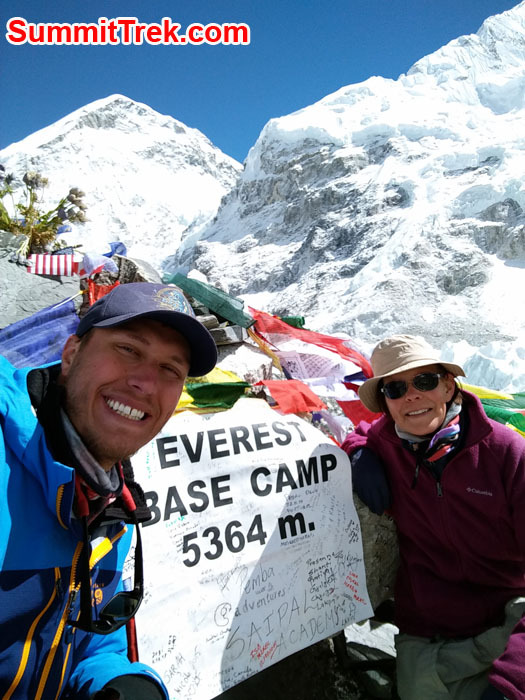 At Everest Base Camp. Kalapather. Photo Leeflang. 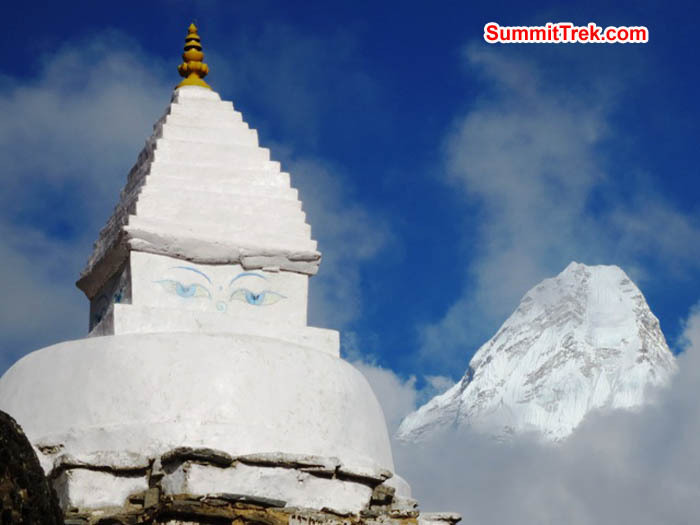 Stupa and AmaDablam close up look from trekking. 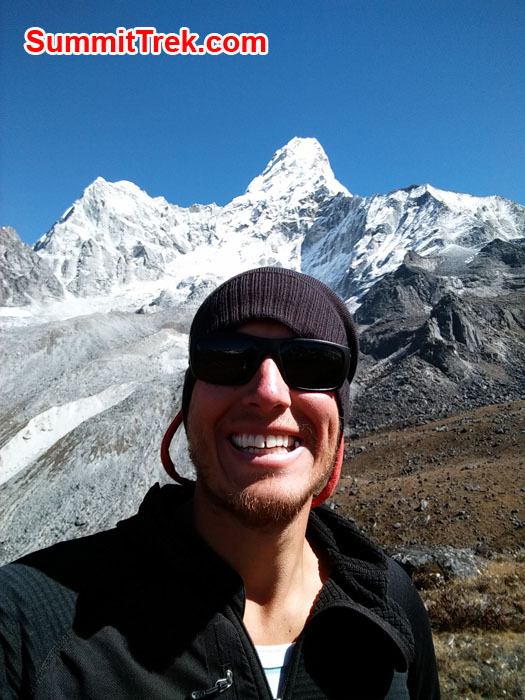 Pangboche lama. 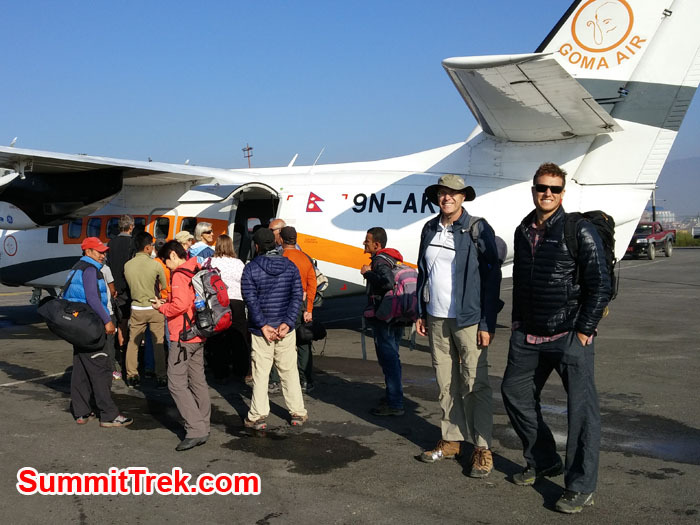 Hiking and Trekking in Autumn season. Photo Felix. Click for photo. Daniel. 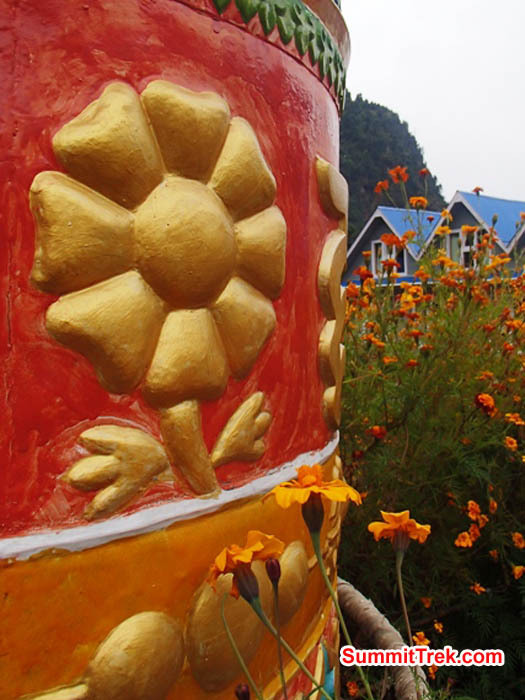 Big Prayer wheel. Photo Jessica. 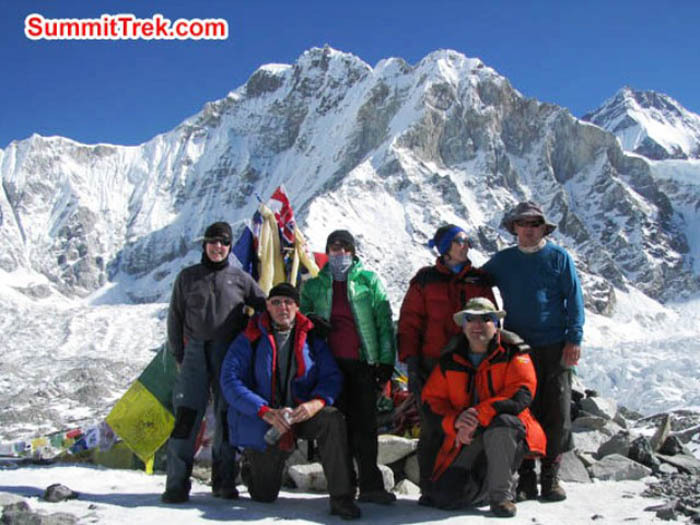 Everest Trekking team at EBC. Photo Haberern. View from Kalapather. Photo Keith Bailey. Dee Haberern enjoying a good book and a warm sleeping bag. Photo by Ron Haberern. 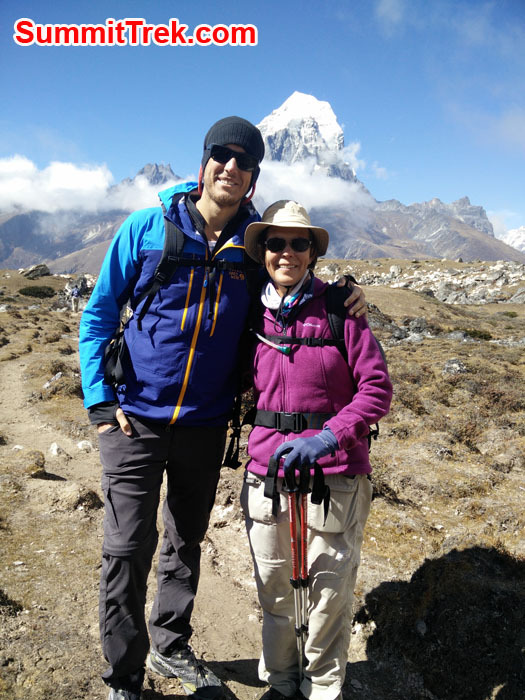 Mount Ama Dablam towers above Pangboche village. Hannah Rolfson Photo. 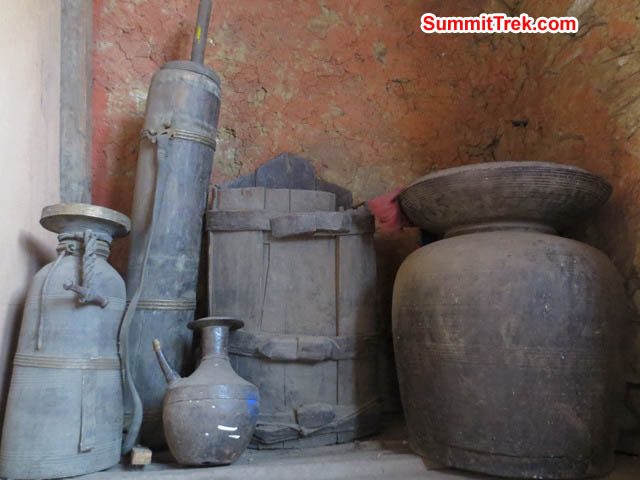 Ancient vessels, butter churns, and chang pots on a shelf inside the Pangboche Monastery. Hannah Rolfson Photo. Elaborate prayer posted above the door in the Pangboche Gompa. Photo Hannah Rolfson. 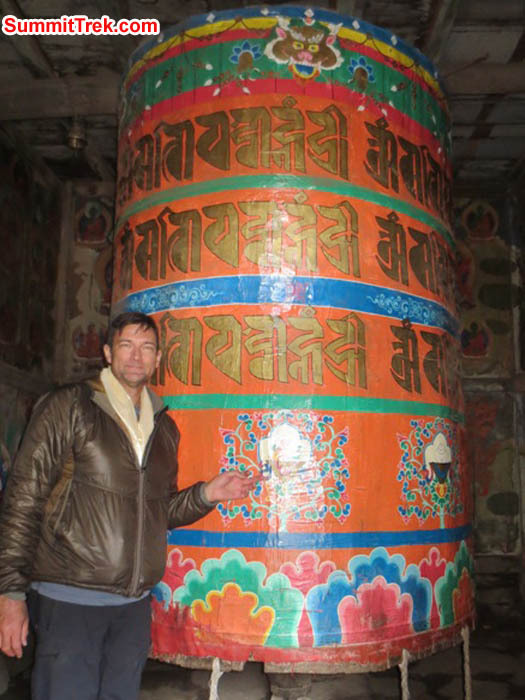 Brian Rolfson spins the giant prayer wheel in Pangboche Temple. Photo Hannah Rolfson. 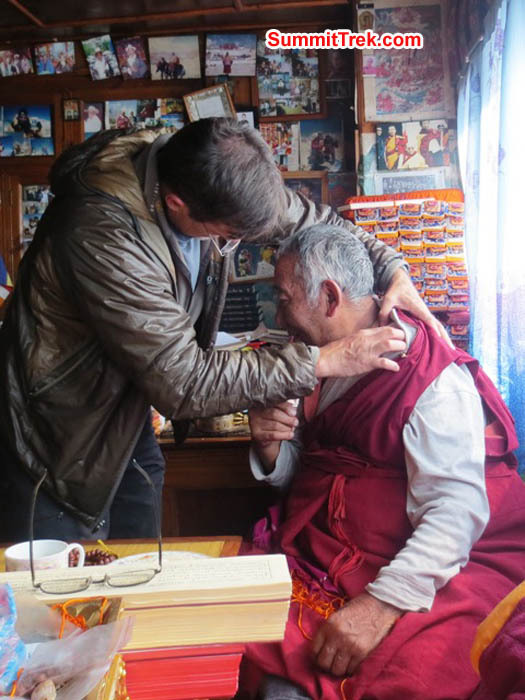 Doctor Brian Rolfson examines Lama Geshe in his home in Pangboche. Hannah Rolfson Photo. 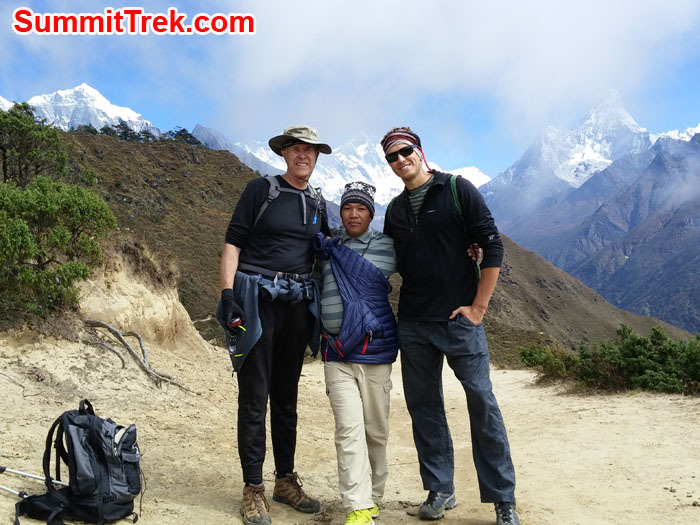 Hannah Rolfson, Brian Rolfson, and Dan Mazur standing in Pangboche Sonam Lodge in front of Everest. Lakpa Gyeluk Photo. Lama Geshe advises Hannah Rolfson. 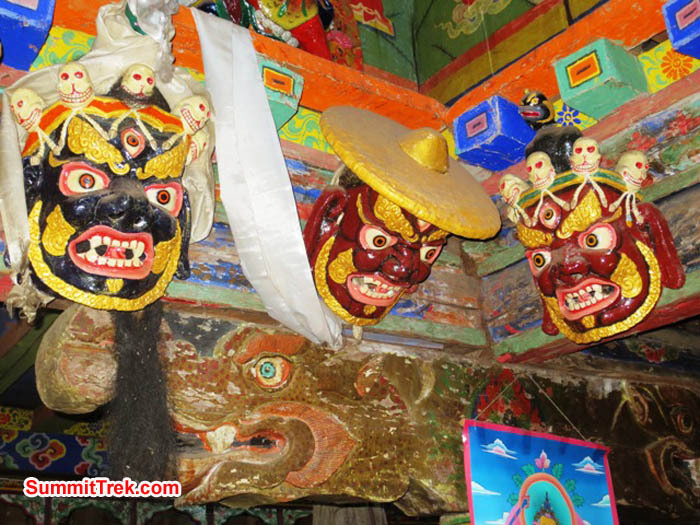 Scary masks and a carved beam support in Pangboche Gompa. Hannah Rolfson Photo. 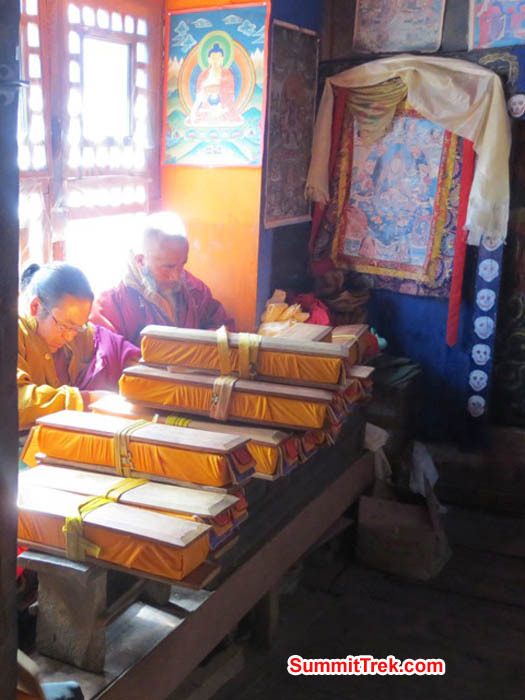 Lama's library of prayer books in Pangboche Gompa. Hannah Rolfson Photo. Monks praying for the reincarnation of a local climbing Sherpa who died tragically. They will read all of the prayer books on the table during a week of praying. Photo Hannah Rolfson. Paining of Padhmasambhava Buddha in Pangboche Gompa. Hannah Rolfson Photo. 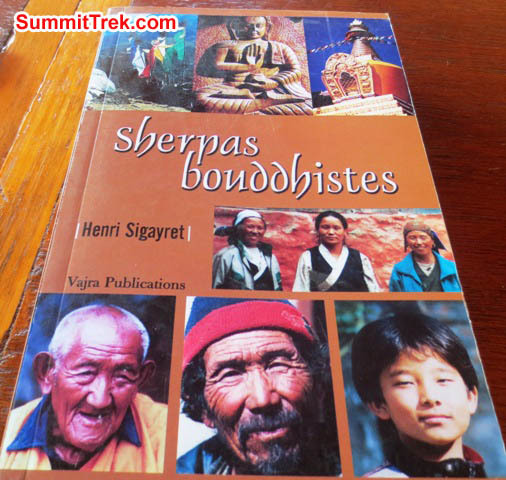 Stringent rules for vistors to Sherpa temples. Hannah Rolfson Photo. 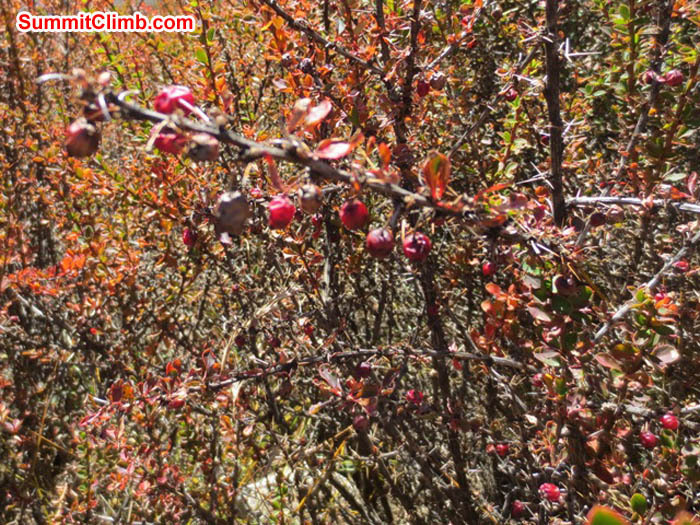 Seabuckthorne berries make a nutritious juice the local Khumbu people can sell for profit to benefit the local economy with local produce. Photo Hannah Rolfson. 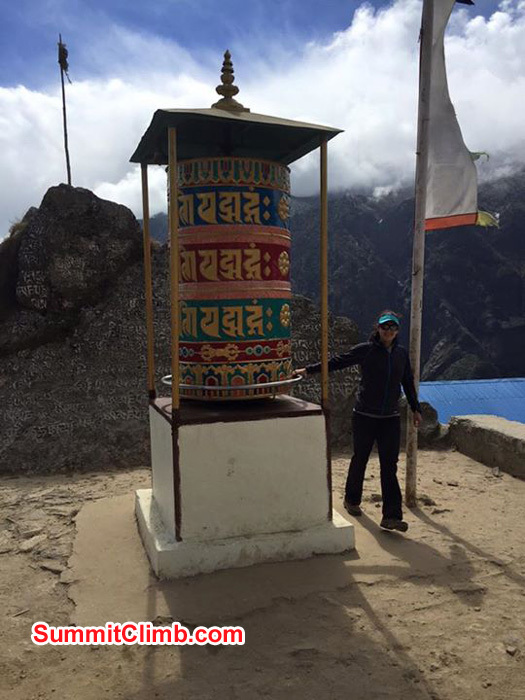 Hannah Rolfson spins prayer wheels at the Pangboche Temple. Brian Rolfson Photo. 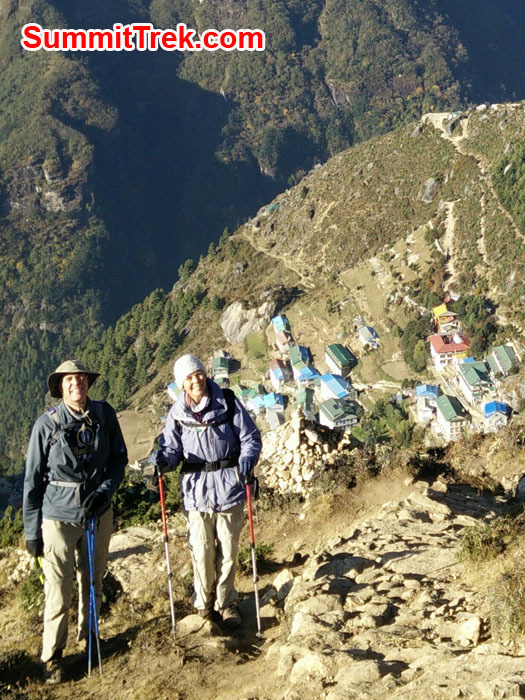 Pangboche's 600 year old temple rises above the rooftops of the village. Hannah Rolfson Photo. Baby yak enjoying a delicious lip licking meal. Hannah Rolfson Photo. What is a Yeti. Hannah Rolfson Photo. 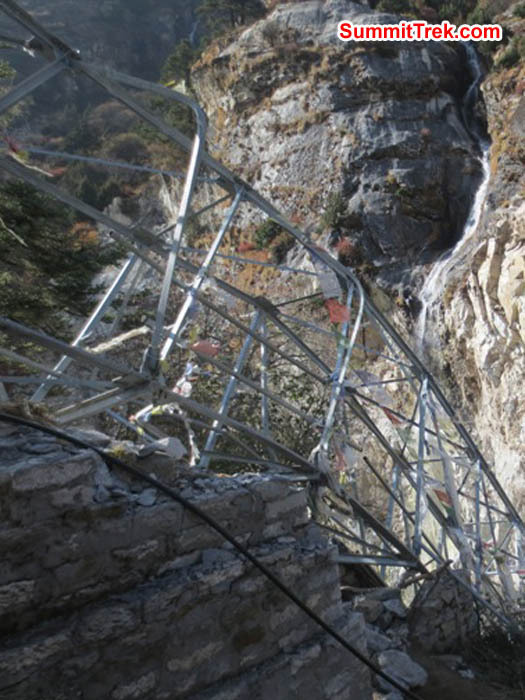 The bridge over the Dudh Khosi river above Deboche collapsed in a landslide, wiping out the Ani's water line. Now the sisters of Deboche Convent (Nepal's oldest have no water supply. Photo Hannah Rolfson. Hannah in a twin room at Sonam Lodge, Pangboche. Photo Brian Rolfson. Woman collects yak dung and carries it in her basket along the trail to Everest. Hannah Rolfson Photo. Mandala 'wheel of life' on the ceiling of the entry gate to Tyengboche. Photo Hannah Rolfson. Lumber carriers on the suspension bridge to Namche. Photo Hannah Rolfson. 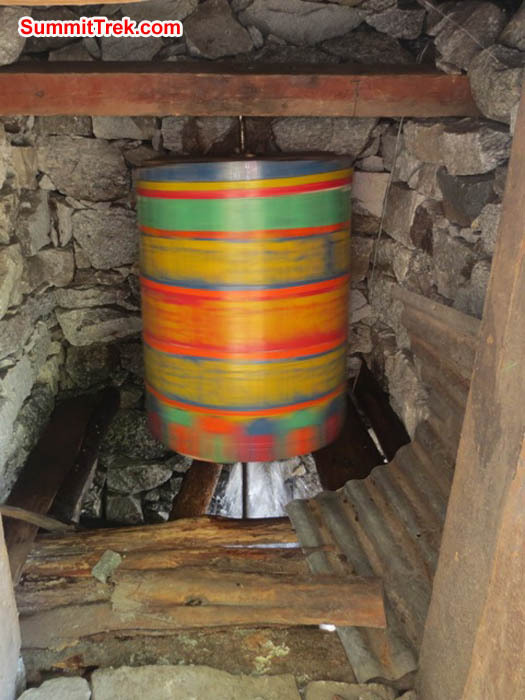 Water powered prayer wheel spins rapidly inside its little house in Fungki Thangka village. Hannah Rolfson Photo. Mount Kusum Kanguru towers above a healthy Hemlock forest on the trail to Everest. Photo Hannah Rolfson. Reclining yak and a woman trekking up hill, along the trail to Everest base camp. Hannah Rolfson Photo. An interesting name for a tea shop. Photo Hannah Rolfson. Monks playing volleyball at Tyengboche Monastery. Hannah Rolfson Photo. Glacier Lake in EBC. Photo Haberern. Summit of Kalapather. Photo Keith Bailey. 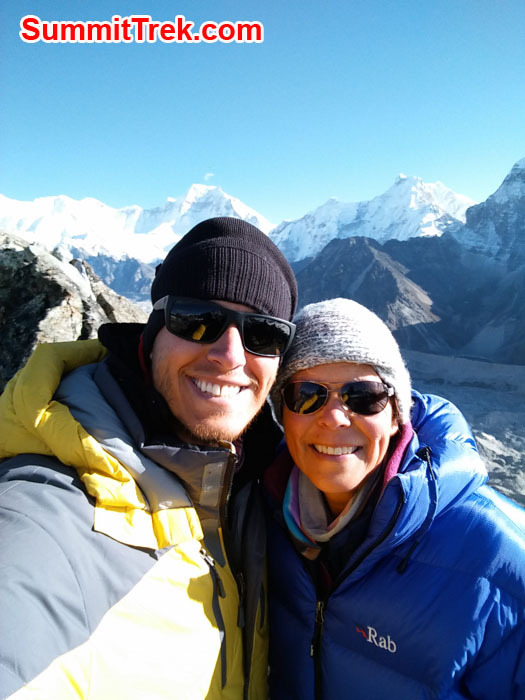 Team at Lobuche. Photo Keith Bailey. Member walking on the snow trail of lobuche. Photo Keith Bailey. Keith Bailey & Lisa Smith is at Dhugla. Photo Keith Bailey. Keith Bailey on the trail of Periche. Photo Keith. 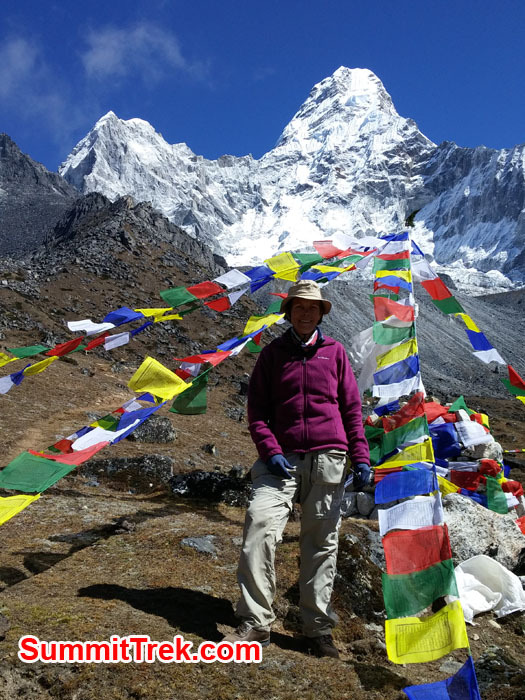 Hannah Rolfson beside the Pangboche Lama's throne and ceiling umbrella in Pangboche temple. Brian Rolfson Photo. Tea shop doorway in Pangboche. Hannah Rolfson Photo. 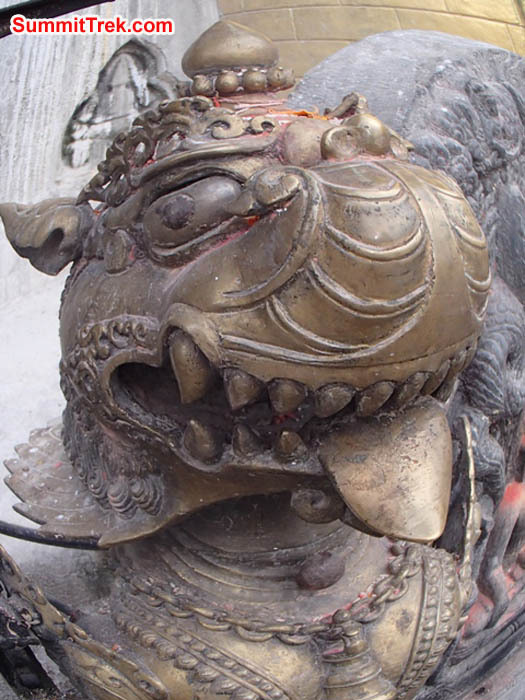 Atop Pangboche hill is located a chorten memorial to a fallen climber. Rosemary and David typing the blog. Sangeeta Sindhi Photo. 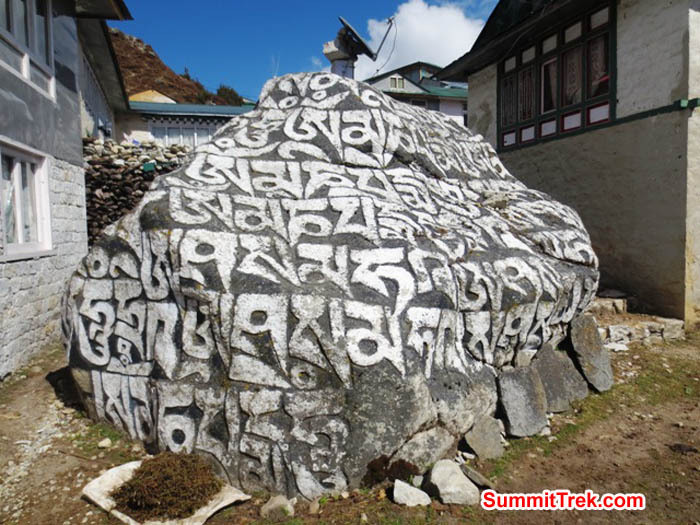 A large pile of mani prayer stones along the trail to Everest base camp. Hannah Rolfson Photo.